Dear Christ Church Family and Friends! 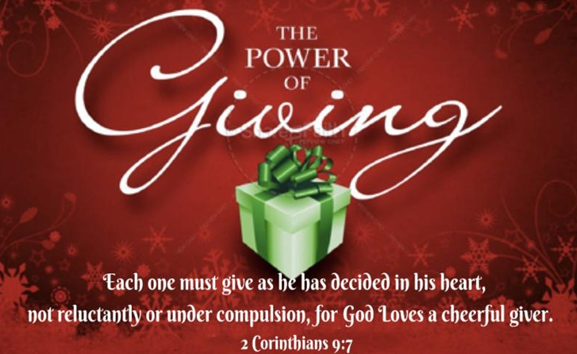 At Christmas God fills our heart with the joy of giving! Our giving is an expression of our love. As God’s children, we know God has given us the greatest Christmas gift ever, His Son, Jesus, our Savior! Why? Because He loves us and wants us to know and love Him forever! As the Pastor I want to say thank you to the Christ Church Family for the way you give away God’s love so freely, joyfully, just the way the Apostle Paul captures it! God bless you for your faithfulness to the Lord! As we come to the end of 2018, I want to ask if you would prayerfully consider giving a special financial gift to help us reach our goal of $9,817. It’s the number our finance team projects we need, over and above regular giving, to finish strong in the black! Think of is at your Christmas gift to Christ Church! Send a text to 631-707-9070 with the amount and the word Christmas (i.e., 50 Christmas or $100 Christmas). If it is your first time, you will be prompted to create an account. You can mail your gift to the church. Please see our Contact page for the address. However you give, and whatever you give, follow the Lord’s leading and give cheerfully! Thank you Christ Church Family! May God bless you powerfully as you bless others, in the precious Name of Jesus!